Well fans have been waiting for something to be released by AMC for The Walking Dead season 2, and fans got a piece during the July 17th premiere of the AMC show Breaking Bad. While it was an inside look into the next season, many people including myself, felt it was pretty disappointing. On Sunday a trailer for The Walking Dead season 2 aired at 10pm which really didn’t show much, or really lived up to the hype that many fans and followers hoped for. The clip showed Rick Grimes, played by Andrew Lincoln, hiding behind a tree in some part of a wooded area or forest. While he hides behind the tree, you can see a zombie approaching from the opposite direction. As the zombie approaches you can see Rick holding a very large rock which is having a difficult time holding due to its size. 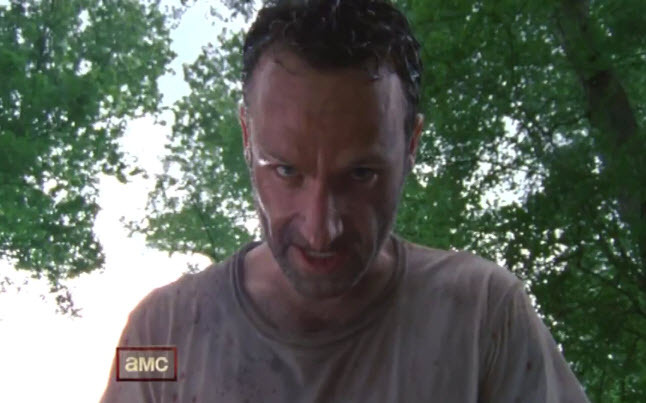 When the time is right, Rick strikes the zombie in the head as he leaves the hiding place he has been in. Then as the zombie lays on the forest floor, Rick grabs the same rock and begins to bash away at the head of the zombie as the zombie’s head begins to smash off. As soon as he finishes that zombie killing, he moves onto the next one seen approaching and The Walking Dead season 2 trailer cuts. Maybe it was the fact that fans have been waiting for so long and expected so much that when we finally seen the clip, we were disappointed as it really didn’t tickle our fancy for the show. We can hope and we can expect more to come as the next season comes closer and closer to airing, but for the moment, we would have to give this one a couple thumbs down. The Walking Dead season 2 is expected to premiere in October of 2011.